"This is not right. How come she is awake so early? It's still dark outside. Has something catastrophic happened? Or is it one of those rarest possible occasions?" "You bet it is! Now run away and hide inside the crevices. I don't want to start off my vacation by hitting you"
This is the conversation that happened between me and the confused fat cockroach at 5 AM on Saturday, June 6th. Only a vacation can motivate me to wake up before the sun rises. A month long planning to identify new places, arrange logistics and pack stuff needed for a week has finally culminated in a perfect vacation to the North East region of India. Our taxi arrived on time and my husband and I left for the Bangalore International Airport. This was our first flight from the new airport and we were thrilled to see the beautiful roads and a nice airport of international standards. After the usual checkin procedures, it was time for breakfast. We were horrified to see a dosa priced at 90 rupees and a cup of tea (prepared with a tea bag, mind you!) for 60 rupees. Though the airport has many restaurants, the pricing seems to be standardized at this range. The flight was on time and we reached Kolkata airport around noon. My dad and my brother had reached Kolkata directly from Chennai and were awaiting our arrival. We had two options - either to book a hotel for the day or roam around Kolkata the whole afternoon since our train to New Jalpaiguri was scheduled to depart at midnight. We went for the second op tion and hired a taxi. The driver took us to a perfect place for lunch - Haldirams. This place was just like a supermarket, the only difference being that sweets and savories are displayed on many different aisles. The restaurant inside Haldirams served a sumptuous thaali and we helped ourselves to yummy rasgullas. Our ride around Kolkata began with a trip to the Science City. With humidity at its prime, we prefered to lock ourselves in an air conditioned room. What better way than to watch a show about oceans inside the auditorium! It was an hour long interesting show on oceans and fishes. After Science City, we went to Kali temple but had to skip going inside since it was too crowded. Having roamed around the city, taking a glimpse of the Eden Gardens and the Howrah bridge, the taxi driver dropped us off at the railway station at 7 PM. With 5 hours to kill, we took refuge in a AC restaurant, ordering milkshakes one by one and sipping it slowly. There was another guy sitting next to us, sipping a can of Mountain Dew for nearly an hour. We were wondering how accustomed we have become with Bangalore's cool and pleasant weather. "Once we board the train, we can just doze off", that was our plan. But it was not intended to be so. I would like to meet the famous guy who came up with this brilliant idea of having a side middle berth in train compartments. People were arguing and fighting for their seats for 2 hours. The seat numbers were assigned for a 81 berth compartment whereas the bookings were only done for 72 berths. Sometimes, people get more agitated owing to their egos that simple math and common sense no longer makes sense to them. It was a long and tiring day and finally the confusion over berth numbers ended at 2:15 AM. The train was delayed by 90 minutes and we reached New Jalpaiguri around noon the next day. The Yatra representative (travel agency through whom we had booked the holiday package) had been waiting for us and he gave us all the details we need for the trip. After the first glimpse of the Himalayan hills, we felt refreshed, watching the flowing Teesta river and the greenery all around. Having skipped breakfast, we found a nice little place for lunch on our way to Kalimpong. We had been traveling for almost 2 days now and as soon as we reached the resort, we took a shower and slept like logs until evening. After taking a walk around for a while, we had dinner and declared the end of the day. The next morning, we left the resort for a sight seeing trip around Kalimpong and planned to travel directly to Gangtok, the capital of Sikkim. 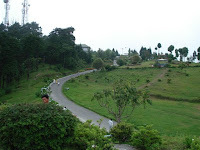 Kalimpong is a little town with spectacular view points around the mountains. The half a day sight seeing trip took us to places such as the Deolo botanical gardens, Hanuman Mandir, nursery and a monastery. The numerous hairpin bends leading to uphill and downhill maneuvers finally took us to the border of West Bengal and Sikkim. After a light lunch, we set off on the beautiful roads of Sikkim with Teesta river accompanying us. We reached Gangtok in the evening and decided to stay at the hotel for the rest of the day. Little did we realize that was a mistake. The next day (Tuesday) was an official holiday in Gangtok and all the shops were to remain closed. We were unaware of this fact as we decided to roam around the market on Tuesday. Our jeep arrived on time the next morning which would take us to Tsomgo lake that is considered sacred by the local people. The misty mountains, the clear streams and waterfalls created a pleasant f eel to the 2 hour drive. After stopping for tea (BTW, we had loads of tea during this entire trip), it was another 30 minute drive on really bad roads. The Tsomgo lake was clear and beautiful. The blue sky created a magical reflection on the lake. There were yaks nearby the lake on which we sat down and took photographs, wearing a cowboy hat. There are some shops around where one could buy souvenirs of Sikkim. We bought a few paintings and also ate some spicy noodles. The Wai wai noodles is the most famous brand in Sikkim that you get them wherever you go. After returning to the hotel, we had lunch and played cards for a while. Having set a well laid out plan that we would go for shopping, we were disappointed because of the public holiday. This is one main glitch we found in the Yatra itinerary. If they had informed us about this fact, we could have planned accordingly. With sudden heavy downpour, the cold weather literally pushed me to dance on the streets of an empty MG Marg. It was a short stay in Sikkim and I wish we could have stayed a few more days. 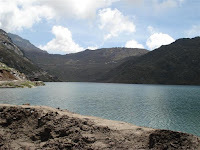 Sikkim has been added to my visit-again list. I have heard some good feedback on other places of Sikkim. Anyway, we left for Darjeeling the next day. With summer season all around the country, both Kalimpong and Gangtok were not that cold as I expected them to be. Probably the best time to visit these places would be winter, I guess. As soon as we reached Darjeeling, we set out for a half a day sight seeing trip to a Japanese Temple, Buddhist Peace Pagoda, the Zoological park and Himalayan mountaineering institute. 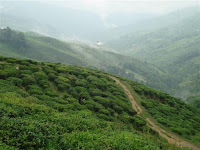 With a thick mist engulfing the town, we wanted to return back but the driver insisted that we visit the tea gardens. For the first few minutes, the visibility was close to zero but once the mist started moving, the tea gardens were a visual treat. We bought some tea packets and then roamed around the market area. The woolen sweaters and shawls are good stuff to buy in Darjeeling. According to the itinerary, we were supposed to leave for Tiger Hills at 4 AM to view the sunrise over Mt.Kanchenjunga. I was excited about this trip but the mist played spoilsport that we could hardly see the sunrise. The driver suggested that the best time to visit this place would be between Sept-Nov. Yeah, point noted! Nevertheless, I bought a postcard which had the spectacular view of Mt.Kanchenjunga. On our way back, we caught a glimpse of the Batashia war memorial and Ghoom monastery. The logistics didn't work out well for the heritage rail ride and so we satisfied ourselves with pictures next to the train in the railway station. The Lloyd botanical gardens was a long walk through narrow lanes and in contrast to many botanical gardens I have visited so far, this was just empty with no tourists. It was a pleasant walk inside the gardens but the route leading upto it was bad. After a short walk through the local market, we left for New Jalpaiguri and after a similar route of NJP->KOL->BLR for 2 days, we returned home. What a nice trip it was! With no access to laptop or Internet for a week, this vacation was just great. As a person who likes to plan trips and also loves to travel, I enjoyed this trip to Northeast. There are many such new places I want to explore. you brought back some memories! north-east is indeed beautiful!! I second Gandhe! Changu Lake would have been an awesome sight! Did you do river-rafting @Teasta?